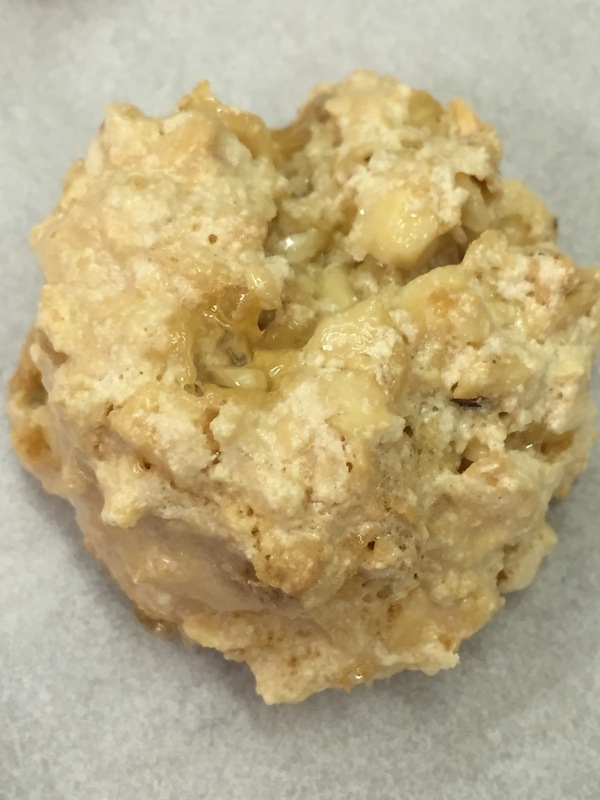 This summer I completed the Culinary Lab: Baking course as part of my graduate program - the Master of Liberal Arts in Gastronomy at Boston University. 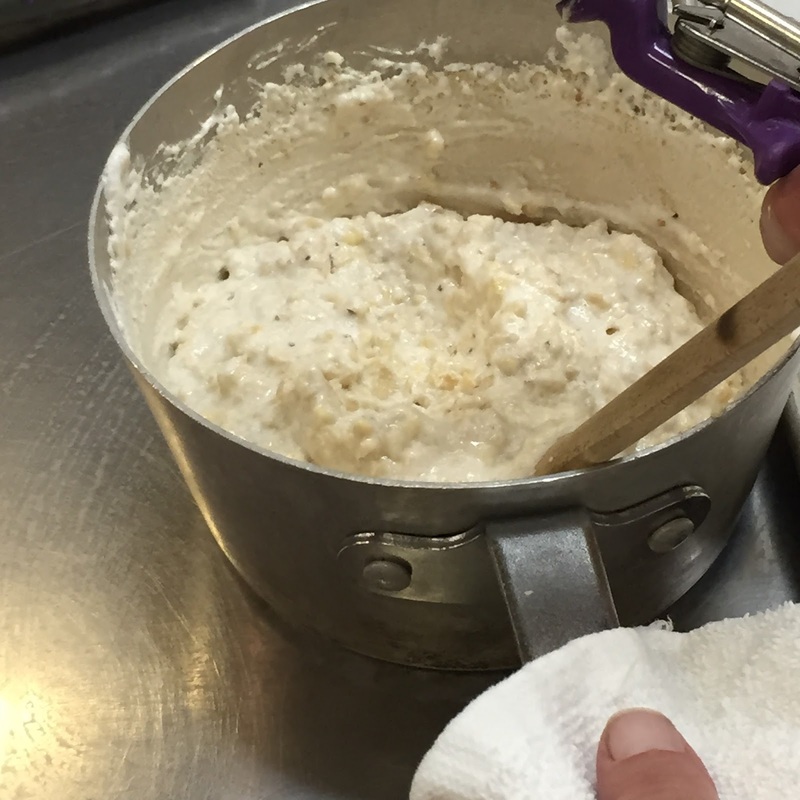 For six weeks I spent two nights a week in the professional kitchen learning all about baking. The course required students to keep a journal of the experience and I decided to record my adventures here on the blog. I hope you enjoy! You'll get the calorie-free version of my decadent baking experience. The last night! Wow! In just 6 short weeks I feel like I’ve gone from occasional home baker a little intimidated by fancy desserts to a baker ready to throw a fancy dessert party. I’ll have to keep up my skills by baking more often, but I’m sure that my friends, family, and co-workers won’t mind sampling the output. 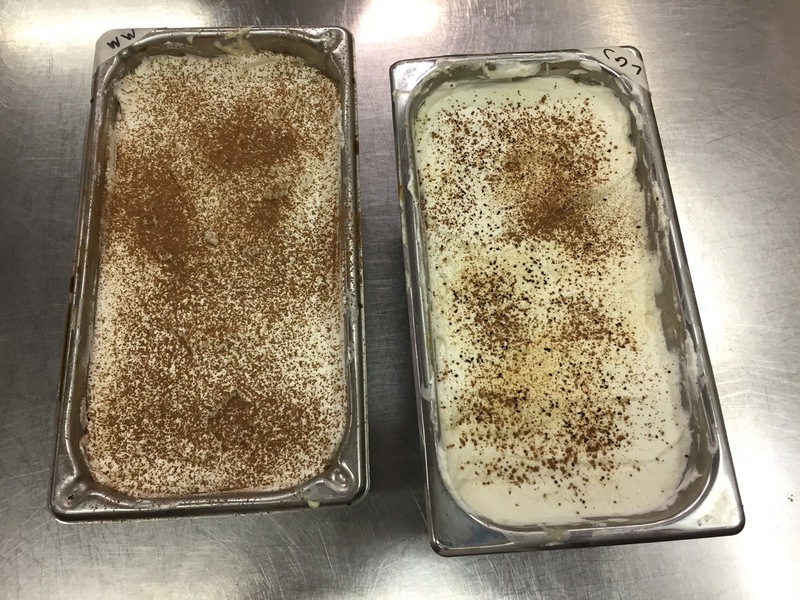 Tonight’s class was all about Italian desserts. A some traditional and some a little different. We had a lot of components to pull together. It’s been a blast working as a team over the past few weeks. Tonight we donned our chef jackets, headed into the kitchen and got to work cranking out our Italian sweets. After a read through of our recipes and agenda for the night we dove right in. My team had three people and we divvied up the task throughout each recipe fairly evenly. We each whisked a custard until our biceps started burning, we took turns watching the mixer spin egg whites and sugar into soft peaks, and we ‘expertly’ turned off the mixer before our whipped cream turned into butter. On the first night we called the chef over to check on us a lot. Tonight I felt that we knew what we were doing and asked for confirmation, rather than direction. Each component of our desserts tonight were like a mini-test, confirming that we had been paying attention all along. The tiramisu definitely did that for us. 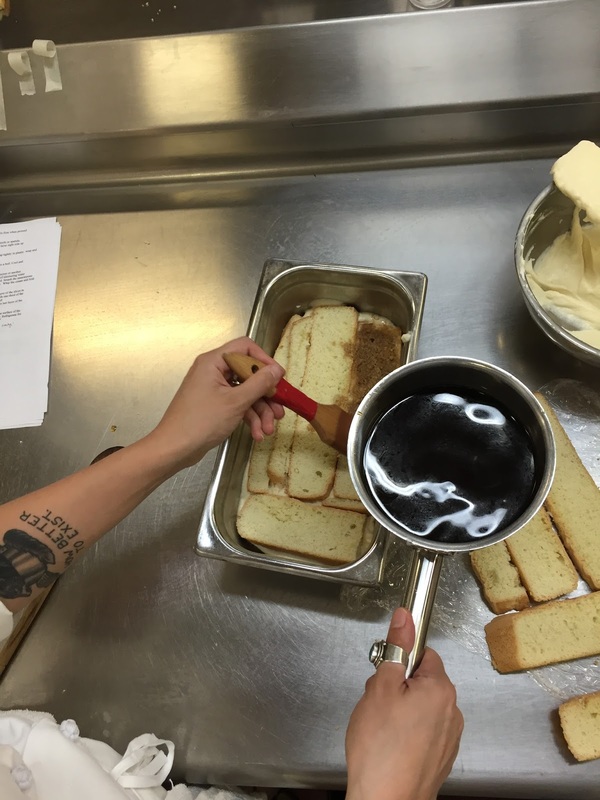 We made a light, melt-in-in-your mouth sponge cake as the base. Next, a boozy espresso simple syrup for soaking the cake. 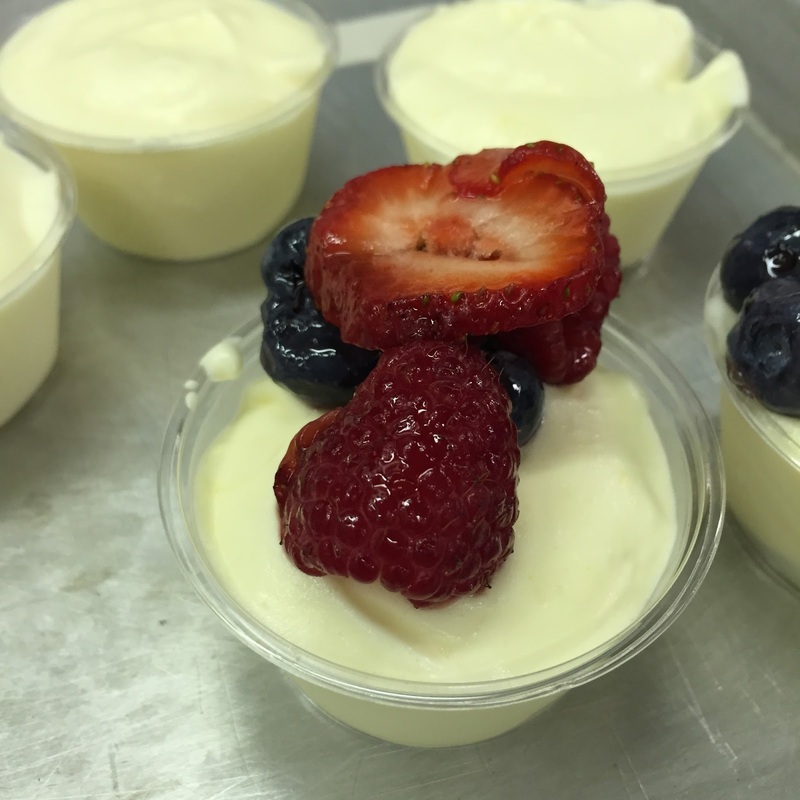 If that wasn’t enough, we also deftly whisked our way to a perfect zabaglione mousse. And no dessert in this class is complete with either additional whipped cream or sugar on top. This called for a sweetened whipped cream on top for good measure. The star of the night for me was the lemon almond cake. The taste of this cake was amazing. Dense, moist cake in the most beautiful shade of lemon yellow. 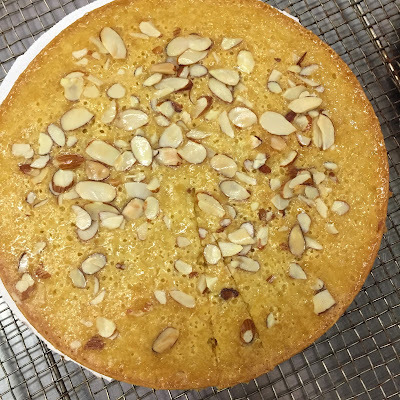 The addition of a generous amount of almond paste made it rich and nutty. 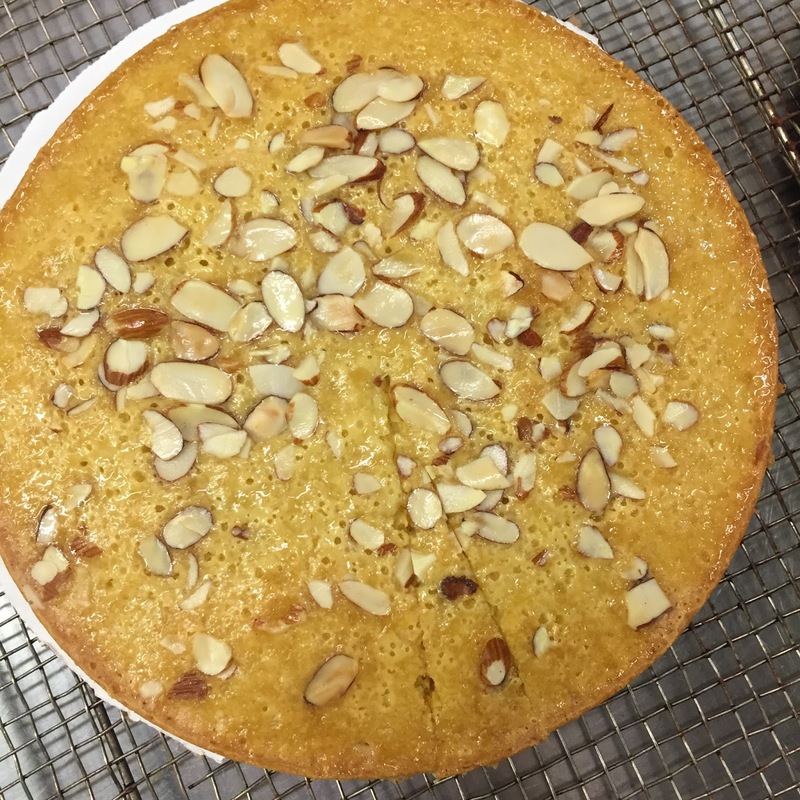 For good measure the top of the cake is covered with sliced almonds and a brush of limoncello (lemon simple syrup for the kids). This cake would be perfect for breakfast, snack, lunch, snack, dessert, and midnight snack. It is that good. It would make beautiful cupcakes for a party or a loaf for a brunch. For the magic trick of the evening, luscious lemon curd was whipped and folded with whipped cream and transformed into a semifreddo. The flavor is tart and tangy and perfect with a few toasted almonds and fresh berries on top. What a fun and relatively easy dessert to know how to make. 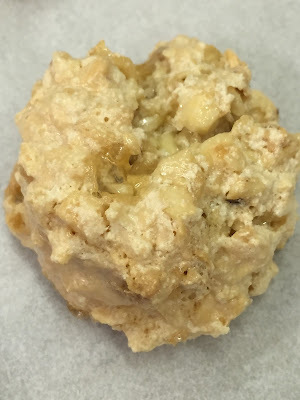 The last, and most unique, dessert of the night was brutti ma buoni – “ugly but good” – cookies. 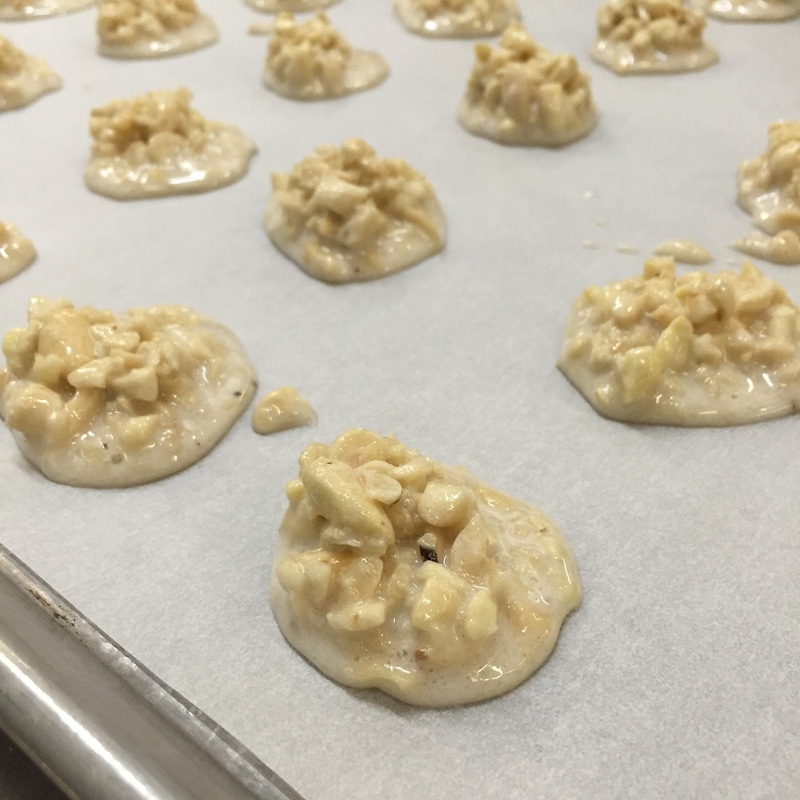 These fascinating little cookies are made with almonds and hazelnuts and a meringue dough. 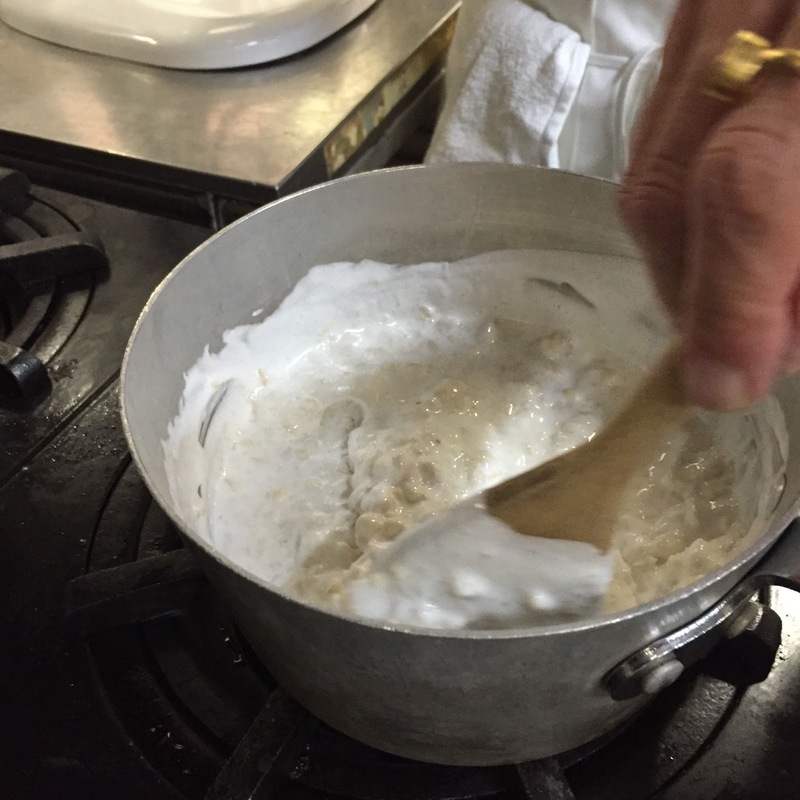 Egg whites are whipped with sugar until they are a beautiful, marshmallowy white color. They are poured over a saucepan full of chopped almonds and hazelnuts. After a little heat and time the mixture turns a beautiful shade of beige. It is important to cook this over the right temperature, too low and the nuts will roast before the meringue is thick. Too hot and the mixture will cling to the sides of the pot. These are baked until firm. The finished texture is crunchy and chewy and the flavor of the roasted nuts shines through. Ugly, but good! I hope that you have enjoyed this whirlwind trip around the world of baking! I’m looking forward to a little break from overindulging in sugar, but am excited to add these new skills to my repertoire. I am excited to be participating in a Super Bowl Recipe Exchange with several incredible bloggers. Along with the recipes I'm sharing with you, here are their recipes to round out your Super Bowl 50 menu. This would definitely be a party I'd love to be invited to! Not only am I sharing with you these great recipes, but I am also excited to offer you an opportunity to win a $100 gift card courtesy of www.wayfair.com! You could choose from one of their MANY slow cookers, or any one of a million other things that will make your Super Bowl Party the biggest winner of the night. The giveaway is open until the winner of the Super Bowl is crowned. The Superbowl is a great 4+ hour excuse to put out your favorite snacks and graze while watching. Growing up it didn't matter who was in the game we always had a party. In middle school and high school my girlfriends and I would always have a Superbowl Bash. I can't remember what we ate at the parties, but I know we always had a great time! Now my favorite things to eat while watching usually involve avocados, salsa, beans, and cheese. I have two recipes that share these ingredients in different ways. First up is a loose interpretation of a tamale - more closely related to the sweet corn tamales from The Cheesecake Factory. These take advantage of some shortcuts and produce a tasty dish. Up second are a healthier take on potato skins. These chili cheddar potato skins are indulgent but not over the top. One or both of these dishes would make a delicious and healthier addition to your Superbowl 50 viewing parties. Both recipes have a number of components but it is easy to work on them at the same time. My workflow is to start the beans first and while they are simmering you can prep the other ingredients. Even better? Enlist your party guests to chop, mix, and assemble their own! I love to make as many things from scratch as I can when entertaining. For this recipe I 'cheated' and included a pre-cooked polenta to stand in for the traditional corn tamale. This speeds up the prep time and makes your life a little easier on game day. I've included the toppings that I like on these, but the recipe lends itself to endless customization. Don't love black beans? Substitute pinto or refried. Hate cilantro? Omit! Run out of lime juice? Use lemon or orange. That's the fun of cooking - you can make it just the way YOU want. If you have leftover toppings you can use them for a dip or a side dish. I used corn oil to enhance the flavors, you can also use vegetable or canola oil. Adjust the quantities based on the number of guests. Adjust the amount based on the size of your party, this is probably enough for a log of the polenta. Ideally fresh corn. If it is not available you can use frozen or canned. You want to saute it for a few minutes to get a little color and develop the sugars. I love potato skins but I don't love the way they make me feel. As part of a game day menu that is usually not light on calories these potato skins offer you a way to feel less bad about your game day dining. Avocado - health fat. Beans with vegetables mixed in - healthy. Cheese - dairy serving! Really, is there ever a reason to not include cheese in a party? I think the answer to that is always no. Adjust the recipe quantities based on the size of your guest list. The techniques are the important part. You can start with my recipes and adapt to your liking. Once you use this method for making the skins you'll be adding them to your menu more often! The secret is another cheat, the microwave! Don't forget to check out the recipes from these other great bloggers and to enter the giveaway to win $100 to Wayfair.com!